The Granite Guy in Columbus Ohio Prides Itself On Providing The Highest Quality Products & Services With All Our Countertop Projects! Just wanted to pass along how happy Janet and I are with the countertops installed yesterday, 1/19. We chose the Purple Dunes and they really look great. Ben and his team were great to work with….professional, courteous, and got into the house, went right to work, and were out under 3hrs. Thanks again and will absolutely come back if we have needs in the future. Responded to initial e-mail request to give them a sketch. Waited about 1-week and then requested a follow-up. So far, no response.Update: Not sure what the mix-up was, but they were apologetic about not getting back to me. They let it be known that this was a very isolated incident and communication is very important to them. They seemed very alarmed that there was a communication mix-up. We couldn’t be more pleased! What a professional company with such wonderful employees! The saleswoman was so nice and helpful when we stopped in for an estimate. She helped me choose the perfect granite for my kitchen with such ease. What an incredible selection at an affordable price! The templater was great as well! The installers were AMAZING!!! They worked diligently, carefully and payed great attention to detail! I am shocked that I can’t see the seams in my new granite countertop! I love to see employees enjoy their work, and these two definitely do! This was a stress-free and very exciting experience for us! I’m so glad I stopped in! Thank you Granite Guy!!! We had obtained several estimates from other granite companies around town, and had already narrowed down our choice of fabricators based on reviews, recommendations, and of course price, when by chance we came across an ad for the Granite Guy. We had not come across the name of the company before and were hesitant to check them out since we had already put so much effort into our search, but after checking out their website and contacting them by phone and email, we decided it was probably worth checking them out since they had an Angie’s List rating of A and their showroom was conveniently located. After visiting the showroom and talking with the owners, we realized our search for a granite fabricator had come to an end and we need not look any further than The Granite Guy. Not only were their prices reasonable, they were very knowledgeable, professional, courteous and friendly. They spent a few hours just walking us through the showroom and discussing our options. There was no pressure whatsoever and we felt very comfortable with them, and just knew we had found the right fabricator. We left after that first visit feeling very confident that we had chosen the right company to do our work. Our search to choose the right color granite took a while, but all throughout the process, they were very helpful, patient and accommodating. They understood that the process could be quite overwhelming with all the granite choices out there, and really wanted us to be happy with our choice. They even gave us some great suggestions. They also provided us with large samples of granite to take home which was tremendously helpful. Their price was also very good compared to the other estimates we received – another company was charging about $2000 more for the same granite!!!!!! We ended up getting a group 6/7 granite for a little more than what the other companies were charging for a group 3 granite. The process from start to finish was just wonderful. The guy who did the laser measurements was incredibly knowledgeable ( he really knows what he is talking about!) and the installers were punctual, very courteous and very hard working. The workmanship was very good, the granite seam was very well done ( many people have commented on what a terrific job they did with the seam) and our kitchen looks absolutely beautiful. If we had not found The Granite Guy, we would not have been able to have choose such a beautiful, exotic granite within our budget. It was truly an absolute pleasure working with The Granite Guy and his wonderful crew, and I would not hesitate at all to recommend this company to anyone interested in getting granite. They were so easy to work with, very cooperative, and I love their service. Their price was the best compared to others in the areas. From the moment I walked into their store front they were extremely helpful. They helped us pick out the materials and explained everything. The installers were also impressive and did an excellent job. Nothing had to be tweaked or re done because they did fantastic work. They were on time, professional, and cleaned up well. I was so overwhelmed with the service and I would highly recommend them to others. We went shopping at the Granite Guy’s new showroom for a replacement countertop on a Saturday morning – and the place was jammed with customers. The staff were very attentive despite the volume. We had to go back home to get more precise measurements for the quote and went into contract later that day. The countertops were put in within 10 days. The installation crew was on time arriving and on time in completing the work. Very satisfied customer. – Julie & Doug J. The entire process from the very beginning went very smoothly. I made a phone call to Bob, we exchanged a few e-mails and some pictures of my kitchen and I gave him an idea of what I wanted to do. I then made a visit to their facility in Worthington. This is where I met the most friendly, courteous, and helpful people I’ve ever dealt with in customer service. Terri was wonderful. She was very helpful with me as I walked around looking at the incredible selection of Granite. I had a lot of questions and she was more than patient with me answering every single one of them!!! I had no idea what I was looking at or what I really wanted and she was a big help with my education about granite. I took home some samples with me when I left and then came back for a second visit to look over all my available options. When I decided on the type of granite I wanted, Terri then scheduld me for a laser measurement session with Walter. Walter was very friendly and answered all my stupid questions as well. I was then scheduled for a final visit to pick out my exact piece of granite, pick out my stainless steel sink, and go through the template process. With the expert help of Terri ,Carolyn and Joe, we positioned my mylar countertop template onto the granite in various positions to optimise the visual effect I was looking for in my kitchen. I relied heavily on their opinion and they were extremley helpful with me making my final decision. My countertops were installed the following week and I couldn’t be happier. The install guys were on time, professional and did a great job. The value for the product and customer service were beyond my expectations. I would highly recommend a visit to The Granite Guy and talk to Terri, Carolyn and Bob before you make your final decision on granite. They made the entire process painless and I feel like I got a great deal!! My kitchen looks great! It went very well. This was our first time looking & comparing quality & color of granite to update our kitchen & bathrooms. We looked at granite colors many times to tie it down to update these areas. They were extremely helpful with the selection and very patient as the projects can be a bit overwhelming.They were prompt in scheduling appointments as needed. We are very satisfied with the results and would highly recommend. I first went to The Granite Guy when I was starting my shopping for a granite countertop. I got there at 5 minutes til 6:00p, and Terri and Bob were more than happy to stick around for a half hour to an hour to talk with me, explain their process, and show me some granite. Their process is simple and easy to understand. 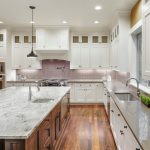 They essentially bundle everything into one, bottom-line price, which is an extremely nice change from most granite suppliers – many of which itemize every item, even backsplashes and mileage charges. I then shopped around for a month or two before returning to The Granite Guy and checking on their stock. By that time, I had pretty much narrowed it down to two possible companies, The Granite Guy and one other granite and marble shop in Columbus. The other shop could definitely compete with The Granite Guy’s prices, but no other shop in Columbus came even close. I repeat, besides one other shop (out of numerous, numerous shops that I visited), no one could come close to The Granite Guy’s prices. This is especially true for the exotic stones The Granite Guy has. I checked the stock for a couple of weeks at The Granite Guy and then made a selection. Carolyn was extremely helpful when I needed assistance picking a color. I then set the measure date and install date. The Granite Guy installed on a Saturday for me, which was a big plus with their company. The person who measured seemed pretty proficient at his job, but he was a bit curt. Regardless, it did not take him too long to measure. The installers were extremely nice and seemed to do a very good job. I appreciated the fact that they took the work seriously. I also had the installers do the plumbing. The plumbing work is okay. I am not sure that I would have them do the plumbing work again, but it was extremely convenient to have them do it the day of installation. The only hang up with The Granite Guy was that for a bit it was a little hard to get in touch with them, due to some health issues of the owner. That is completely understandable, and other than that, they are a great company, nice people, and I would definitely use them in the future. In fact, I doubt I would really shop around again. They have nice products at a very good price. I visited The Granite Guy’s showroom when they were in the midst of moving their business. Their manager was ill and not able to work at that time and the majority of the employees were busy moving materials from the old location to a larger building. There is an impressive selection of distinctive granite slabs available from which to choose. If you are looking for a unique piece of granite, this is the place to go. I did receive assistance after calling the business’ phone number and filled out an information sheet. I was given a sample of a few types of stone to bring home after I filled out an information sheet that included a sketch of my kitchen’s floor plan and measurements of the current counter tops. It was helpful to take some basic measurements prior to visiting this business so that Bob (the manager) can provide an estimate of the cost. A few days later I was able to get estimates of the cost for the job with the different stones that were under consideration. I returned a couple weeks later with my husband in tow to finalize our decision on the stone that we had selected. The manager Bob informed us of what to expect. We made appointments for having Walter measure our current counter tops, a time for me to look at how templates would be laid out on the stone slab and for installation. These dates were only two weeks in advance—-a very rapid turn around time for custom made counters. Walter was incredibly meticulous in taking measurements in my household using expensive laser equipment to ensure an accurate fit since walls are not always true. He was able to have the templates ready for layout in less than 36 hours. He came on a Tuesday morning and I was able to come in for a layout the following afternoon. Greg, head of fabrication made certain I was satisfied with which part of the slab would be used for the most visible portion of my counter and for the desk. The stone was cut on Thursday and installed on Friday morning by Jessie and Matt. The installation crew was able to tear out my old counter tops, remove the old kitchen plumbing, install the new counter tops and reconnect the plumbing and replace my faucet all in 3 hours. They did a fantastic job other than small nicks on my window ledge where the new faucet hit the wood and along a wall where my old (soon to be replaced) wallpaper was also slightly damaged. The seam between the two major pieces of stone has no gap—a sign that the measurements and stone processing was top notch. I was impressed with how hard everybody at The Granite Guy works. This business has been growing rapidly over the past few years and has managed to provide excellent service and a quality product at a very competitive price. There is a reason why Bob business is successful—quality product and fantastic service! Great experience from start to finish. Helped answer all of our questions when we began shopping for the project, obtained slab we selected from supplier, and was able to get all of our needs from a single slab. Arrived on schedule, removed existing material, and installed new parts and counter. The existing plumbing under the sink created some unforeseen problems, but they were able to correct the issues the following day, leaving the plumbing in better shape than when we started, and we now have a kitchen to be proud of! Great experience. The turn around time was great. They measured one day and installed approx 4 days later. We were very impressed with the tool that they use to measure – some sort of laser/ computer program. The countertops look excellent. You can hardly see the seems. Everyone we worked with from the owner to the guy who measured our kitchen to the installers were great. Our cabinets were late with installation so we had to move our countertop installation and measurement back. Plus we were expecting a baby about 2 weeks from our countertop installation. They were super accommodating and even sent out their measurement guy out on a Saturday so we could have the counters before the baby ( we ended up having our baby 3 days before they installed our countertops) Would definitely recommend The Granite Guy! Easy to work with, walked in Monday morning and island countertop was installed Friday afternoon. Prompt service, quality materials. Install took 10 minutes. A few big box stores would not work with us and requested a minimum order. Granite Guy handled our request with no issues. We started this process during a time when the owner was ill. We had some difficulty getting calls and emails returned. Once he returned the communication vastly improved. They were the lowest price we found. I choose the slab of granite. The templater was very thorough and professional. I had to change the install date due to a delay on the cabinet installation and Bob was very accomindating. The day of the install the guys called to say they were on the way. They also installed a large sink and drilled the hole for the faucet. They were professional too. The countertops look great. Bob is by far the most honest and helpful. I purchased granite from Bob for 3 bathrooms and was extremely pleased every time. I will never use anyone else. No contract, which was very nice because many companies make you sign a contract with unclear details and worrisome descriptions if something wrong. Very professional and friendly. Let us take home a large sample for a week to determine if it was the right fit. Measured one week after we decided and installed three weeks after the measurements, very quick turnaround. Provide 15 year protection of granite, cleaner, sink, deconstruction, installation, etc all a part of the package. Installers were very professional and completed an approximate 46 square foot countertop in 4 hours. Staff was great- very friendly and professional, all the way from helping me pick out a slab of granite to measuring, cutting and installing the countertops. Everyone was very punctual and professional when coming to the house. Prices were very reasonable. It was one stop shopping for granite counters. I would use them again without hesitation. From the first time we visited, Terry and Bob were wonderfully patient and professional as we “agonized” over the many choices available. It took us 3 visits to decide our granite and we are thrilled with the results. The beautiful craftsmanship is obvious in the fact that it almost impossible to find a seam in the counter. The price included a high quality sink (we chose a 16 gauge stainless steel) and we opted for the $199 plumbing installation service for a new garbage disposal and faucet. This was an excellent experience from start to finish and we will certainly return to them during our master bath remodel. I have already recommended them to a friend. Good overall experience with this provider. Countertops were installed on-time, and within the cost initially estimated by Bob (The Granite Guy). 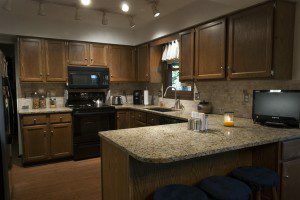 I would use this provider again- countertops look great! It went great! Their store location has a lot of slabs to choose from – all price points. It’s great seeing the whole slab vs little samples. Their prices were competitive and included a 16 gauge stainless steel sink and the disposal of old countertops. We found that other’s charged for this service. Bob and Terry (owners) were very friendly and accommodating. Bob offered to make a second trip to install the rest of our countertops when one of the cabinets came in damaged and had to be re-ordered. The installers were punctual, clean (laid a tarp out on the floor where they placed all of their tools), and friendly. The person who came to measure was very thorough – the counters fit and look great! I highly recommend them. My wife and I found a piece of granite that was unlike any other we had ever seen… we immediately fell in love with it and had to have it! Not only is it exotic and unique, but it was less than granite we found at Home Depot, Lowes, and some smaller granite suppliers. We had a huge kitchen remodel and the installation only took 1 day. Bob was fun and great to work with! The service, price, selection, and quality of installation was outstanding. We are so happy! I’ve had Bob “The Granite Guy”, install Granite countertops in three different kitchens for me. I’ve never had any problems with his installs, and everyone of them turned out amazing. The experience was fun, not stressful at all either. The people at the shop were very friendly and the lady who waited on us was so very knowledgeable about all of the granite and gave us excellent advice. She explained the pricing and what all it involved and there were truly no hidden costs which made it so much easier. From the very beginning The Granite Guy had fantastic customer service. They were very quick with getting back with me with all my questions. They were very punctual with all the measurements and appointments. We had been to just about all the granite stores in Columbus, Ohio and The Granite Guy was the best price we could find. The sales person from Lowes could not believe we were getting everything we were given for the price at The Granite Guy. In addition the the best price the fabrication was very good. The seam in the granite can not be seen. The Granite Guy was able to sell us an upgraded granite for close to the same price as a base grade granite. If you are looking for the best price and very good customer service then I would definitely recommend The Granite Guy. They also were very accommodating to us with treats and water for our kids while we made our decisions. Bob and his team were extremely kind and helpful during this process. After contacting Bob the first time he responded immediately to all of my emails in detail and I was able to speak to him directly on the phone whenever I called. His employees helped me choose and decide on the pieces that would look best in my kitchen and the price was fair. Seamless is the best way to describe both the buying process at The Granite Guy and their final product. At The Granite Guy showroom, you can select your granite slab. That is right; you are not looking at a 12″ by 12″ sample, but the entire slab. The price includes everything, including the kitchen sink and removal of your old counter top. You can upgrade the sink and pay for them to connect the plumbing, but that is it. The Granite Guy makes buying so easy. The installers are craftsmen, who really care about their work. They proudly told me they have the best seams in the business. And I believe them. The guy, who installed our tile backsplash (from another company) and who installs a lot of tile in kitchens with new granite counter tops, had trouble finding the seam. So did two friends who came to see our new kitchen. If you do not know where to look, our counter top is seamless. I was remodeling both mine and my daughter’s kitchen and we both needed new counter tops. We both wanted granite and looked at the big box stores as well as some local granite fabricators. None of the places we went were very helpful, they didn’t have much local inventory and the pricing was confusing. There was a price per square foot but that did not include the cutouts, or the sink. We got some estimates for our kitchens and they were all about $4000 each. I looked on Angie’s list and found The Granite Guy’s site. I stopped in one day and was greeted by Terri and her little dogs. She made me feel at home and explained the entire process. Their pricing was complete including the kitchen sink which made the buying experience much better. Over the next few weeks we spent a lot with Terri and Bob and they were great the entire time. We finally picked the slab’s of granite and both kitchens were installed in the same day. Overall the pricing was at least $2,000 less than the other places and we were treated like friends. If you ever need granite or marble or quartz, do yourself a favor and check them out. I was referred to Bob by another friend that enjoyed their service/product. Boy am I glad we went with him. Not only was the final product amazing, but every person we dealt with was incredibly responsive, polite and knew EXACTLY what they needed to in order to get us the best possible product. We had them install granite in our kitchen, kitchen island, butlers pantry, 2 bathroom vanities, our master bath vanity, a shower ledge and shelves and a tub ledge. Bob went out of his way to make sure we had what we needed — even when it meant a quick turnaround to meet our strict timeline. When our builder ordered our cabinets incorrectly, they worked around the issue and it didn’t slow us down one bit. I honestly cannot say enough about the level of service and the great product/price. I’ve already started recommending them to everyone I know. You will NOT be disappointed! Oh and I play a game with every person that comes into my kitchen — it’s called “see if you can find the seam” — so far, nobody has won that game! Ha! Amazing work. The granite in my kitchen is beautiful. Bob the Granite Guy, and the craftsmen who work for him went out of their way to make sure we got exactly what we wanted. They called when they had my slab on the cutting table because they wanted me to come in and see where all the features of the natural stone would be in my kitchen. I decided to make some changes which caused more work for them, and they were totally cheerful and professional. The installation went beautifully, and my engineer husband was very satisfied with how square and level and properly supported everything was. Excellent experience- highly recommend. My husband and I visited the business office and picked out a piece of granite from a huge selection. Then we scheduled a day for measurement in our home. The professional arrived on time and carefully measured the dimensions needed using laser technology. Next, back at the business office, the granite was cut to size and prepared for the installation. On the scheduled day, removal of the old materials and installation of the new went very smoothly. I’ve been to several granite yards/fabricators in the Columbus area and LOVE Bob the granite guy. They have THE MOST BEAUTIFUL granite selection from what I’ve seen and I can actually pick the pretty ones because they are in my price range when I work with Bob (not any where near my price range with others). Templating was done by Bob himself and install done by his crew. All were professional and courteous. I will work with Bob every chance I have. He did our kitchen counters first and is working on our bathroom counter now. Thank you. WOW! Bob and Terri are incredible. They had lots of helpful recommendations along the way and had excellent workmanship in their cutting and installation of our granite. Our center island, which we are using as our table, has the most beautiful natural design thanks to Terri’s experience and keen eyes. Their installers were excellent and very informative. I contacted Bob after seeing his ad on Craigslist. Bob emailed me an extremely competitive quote. He then came to my home to take measurements, next we set a date to do the install. On the day of the install, Bob and another one of his installers showed up on time, completed the install in 1 day, and left the job 100% completed and cleaner than when they arrived. Bob and his installer took extra steps to make sure everything was perfect, the joint in the granite countertop is nearlly impossible to notice! I have used other granite installers before I used “The Granite Guy”, but I will never use anyone else besides Bob again. They were amazing, extremely professional, they have the best quality for the best price. Very personable and didn’t try to sell us other things. Installers very great at all aspects, including the clean up. I would HIGHLY recommend!!!!! We love our new granite! When we first broke ground on our new home, we shopped around for granite, hoping our budget would allow us to install granite in both the kitchen (with island) and master bath (10 linear feet of counter). We trekked to Columbus on the advice of a good friend who had bought her granite from The Granite Guy. We wanted to actually see the slabs in order to choose, and we weren’t disappointed. They have an excellent selection. We ended up getting our kitchen, master bath, a 5 foot vanity in our Jack and Jill bath, and a small vanity top for a powder room for $1500 less than we were quoted by another granite yard. I will post pictures when the house is completed, but our granite is beautiful! Our backsplash installer pointed out to us that we received an excellent install, pointing out the perfect fit in every corner. We are SO glad we got our granite here. Great price, excellent quality, and skillful service! Bob and his team were a pleasure to work with. Despite the tight time constraints we were working with (I had a party deadline request) Bob made it happen just in the knick of time! He was such a pleasure to work with and his team was very accommodating and professional! From start to finish, The Granite Guy was a breeze to work, and the granite looks FANTASTIC!!! Thanks Bob, we’ll be using you again!! I found the granite guy posting from Craigs list. I was very skeptical on purchasing granite from Criags list. I sent him email just to get an estimate since it says email your drawing and you will get an estimate through email. Sent me a lot of information and was very impressed. The guy seems to be very hard working and I was getting his emails around 11:30 PM which says the guy must be busy during day time. I stopped by in about three weeks to his show room. He was not pushy at all and answered all my questions. He gave me a quote and piece of granite I chosen to see how it looks in my kitchen. The price is much lower than his competitors by over $1500. I do business and know some people in the cabinet industry, but I could not find anybody who can says anything bad about him. To make long story short, I ended up buying my granite from him and we are very happy with the work they did. Here is what is good about them: His price is extremely low. It is much lower than anywhere else. My wife has been everywhere and none of them were close to his price. Scheduling an appointment was within two weeks and showed up on time. Our island order was not in and they told us to finish that once the island came in. When we called back around 4 pm, all the installers were busy on a job. The owner and the manager came themselves around 8:30 PM to finish it the job. That is what I call an excellent customer service. It has been a while since I have seen this kind of service and now I am finally realizing that I don’t have to deal with lowes and home depot headache any more. Walter, who measured our kitchen, was extremely professional and considerate. We have three young kids and he recommended the round age at no extra charge. Installation was very professional and even adjusted our dishwasher that was installed by Lowes people correctly. They did not have to do that and we were very impressed and those little things like that that takes customer satisfaction to the next level. THE SEEMS are amazing. I could not find one of them until my wife showed me where it is. My cabinet guy was very impressed by it too. He even said that he is going to contact them and see if he can work with them. I am sure you know by now how satisfied we are. I don’t usually write reviews, but these guys deserve more than that. We are so happy and we are working hard to send them some clients in their way. BTW, I am a licensed real estate agent and I am sure I can find them at least a couple deals for sure. I have seen a lot of jobs in granite and this one rate one of the top. You can never go wrong with these guys and please don’t waste your time going around places. Check this guy out and may be a couple more and you will see what I mean. Thanks Bob for the job well done!! AWESOME, AWESOME AWESOME! Search no more! These guys are the best!! Over the years, my husband and I have re-done more kitchens than we would ever want to admit. We were stunned by the services The Granite Guy provides for the money. We took our exact kitchen measurements with us during Christmas week. Looked over their selection. Chose the granite called Coffee Brown. Gave them our exact measurements. They asked us to pick out which sink we would like installed, that it was INCLUDED in the price (brushed, 16-gauge stainless steel sink – several styles to pick from). We chose the 60/40 split. 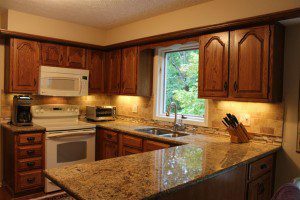 In the price that was quoted was the granite, sink, fabrication, removal/disposal of old counters, FULL installation (granite, sink, new faucet, new garbage disposal). We did not ask for backsplash, as we were going to put in tile backsplash. From the day we walked in to the day they installed was exactly 2 weeks (and this was over the holidays). Greg did the template (nice and professional!!). Took Greg a couple of hours. Matt and Jesse did the install (also very nice and professional!!). Again, these guys had it done (and were very clean and neat) in just a few hours. No joke, the next day after install, we found out that we were being transferred to another state. For the sake of time and money, we returned the tile, called The Granite Guy and asked if they would do a 4 inch backsplash. Long story, shortened…. we had backsplash in a week and saved $500. We have referred this company to AT LEAST 6 people so far. Like I said….. AWESOME!